#OrganicSeptember gave us the perfect excuse to demonstrate just how easy and fun it is to make Organic Blueberry Pancakes for breakfast, or indeed at any time of the day. They are particularly awesome if you have guests in the house as we have found time and time again. Just make sure you make extra ones because there is always one or two people who just can’t get enough and will eagerly volunteer to polish off any that are left. They are delicious served with sliced bananas, strawberries and organic fruit yoghurt, and if you are feeling extravagant, maple syrup, honey and even chocolate sauce will take the deliciousness to a whole new level! This recipe is designed for simplicity and speed, so for the flour and the milk, use equal 1:1 measures. 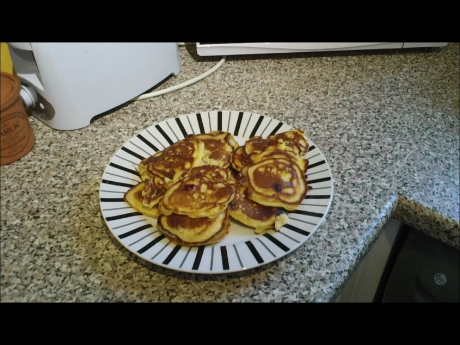 Here, 100g is the same as 200ml and will make approximately 16 small pancakes.